One day after images that claimed to show the design of the LG V30 leaked out, LG appears to be sending out invitations to the device’s official reveal. 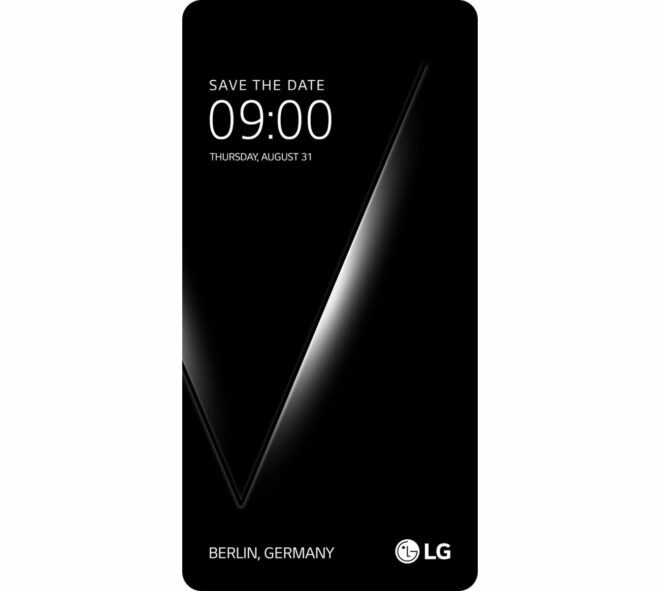 LG is sending “Save the Dates” for an event on August 31 in Berlin, Germany. The invitation looks like a tall 2:1 display and includes whats looks to be a “V” on its wallpaper. While LG isn’t coming right out and saying what it has planned for the event, the V30 seems like a solid bet. Not only are we right around one year out from the LG V20’s debut, but LG also chose to include a “V” wallpaper in its invitation to hint that a V-series device will be the star of this show. T-Mobile has offered both the LG V10 and V20, so it seems likely that T-Mo will have the V30 on its shelves as well. Based on what we’ve seen and heard so far, the LG V30 looks like it’ll have a tall LG G6-style display, dual rear camera setup, and a spec list that includes a Snapdragon 835 and at least 4GB of RAM. Based on the LG V30 rumors that we’ve heard so far, are you interested in this device? I have owned the V10 and currently an owner of the V20. The V30 would only interest me if it still had a removable battery and the 2nd screen. (which it seems that it might have neither). I personally enjoy the extra screen as it has helped with multitasking for me. Looking at the picture… could it be possible that they somehow moved the 2nd screen to the bottom? I guess we shall see come August if I will jump! to this phone or wait for the V40 or possibly something else completely. I like LG I just hope they don’t let me down like Samsung has done over the past few years. Not having a removable battery is a big no-no! Copying the rest is a mistake LG! I don’t mind non removable batteries as long as they add water resistant features. Hopefully your right on at least the 2nd screen. I was thinking the wording where it says, Berlin Germany LG, (at the bottom of the photo) could actually be the second screen…. maybe not… but the screen actually placed there may be even more usually than having it at the top. Looking forward to this… and the Pixel 2. I know that prices continue to creep up at launch, but hopefully LG’s V30 will drop shortly after or have some promotion that will keep it in a reasonable net price point. My personal target for the V30 would be $550 before I would bite. But I know that they will most likely start off with a $750 price tag for the V30, so the $200 drop will most likely happen for late November (Black Friday). Dang 4th one, I only had two replacement G4’s. Luckily they replaced my G4 with an S6 for the third replacement. On the G6 now, it’s a good phone though I’m getting a U11 around Christmas time. yeah no more LG for me. They still have not updated my dads Lg v10…. They are a joke.